Nora Aunor was beaming with pride talking about her latest film, Taklub, when DLIST met with her for an informal interview in her Libis residence a few months ago. One could tell the excitement she was feeling when she realized that this film would be her comeback to the Cannes Film Festival red carpet after more than three decades. 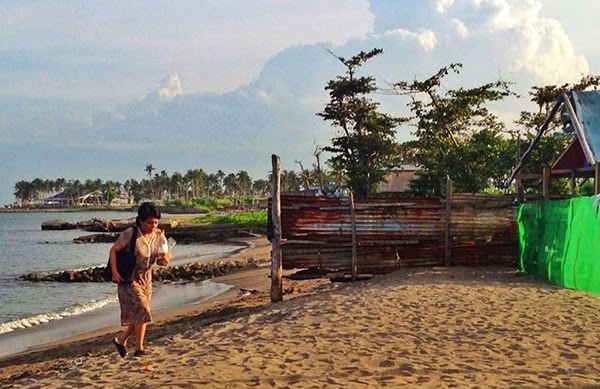 Taklub, which is produced by Loren Legarda, among others, is a film about the aftermath of Typhoon Haiyan that left the southern provinces of the Philippines completely devastated. Aunor, who played the lead character, reflected how amazed she was during the 10 day-shooting in Tacloban. “Iba talagang gumawa si Direk Brillante. Para talagang tutoong tutoo. Akala nung iba documentary ang ginagawa namin,” Aunor exclaimed. When it was announced that Mendoza’s Taklub made it to Cannes, though not for Main Competition, both fans and cineastes were on their feet for this supposedly historic event. Aunor and Mendoza, both considered toasts of world cinema and Philippine flag-bearers in their own rights, are expected to dominate the most prestigious film festival in the world. Unfortunately, as of this writing, Taklub staff, a few actors, and producers are now all in France for the traditional photocall without the film's star. Nora Aunor failed to grace the event due to circumstances that could have easily been avoided had it been handled better by the film's producers. 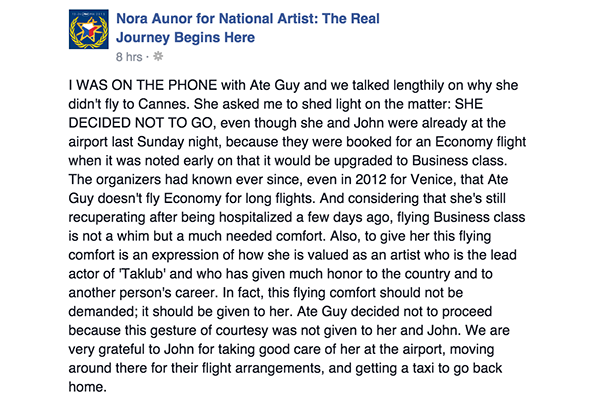 According to a very reliable source, Aunor was not informed beforehand that her request for flight upgrade had not been accomplished so she went to the airport expecting the Business Class tickets that she was accustomed to. The entire entourage of Taklub had already flown to Cannes a day prior without her. Incensed by this seemingly lack of proper coordination, she decided not to pursue her travel schedule anymore. Confidantes of the Superstar claimed that had she known about the tickets earlier, she would have upgraded them herself. Instead, she ended up having to take a cab on her way home - something she rarely does given her public stature and security concerns. Upon learning about the incident, fans of the Superstar voiced out their frustrations in social media; expressed disgust over what they call "an utter disrespect for someone whose persona has been revered internationally." The Film Development Council of the Philippines gave Taklub considerable festival grant in order to accommodate the production, which would cover Nora Aunor’s travel budget. 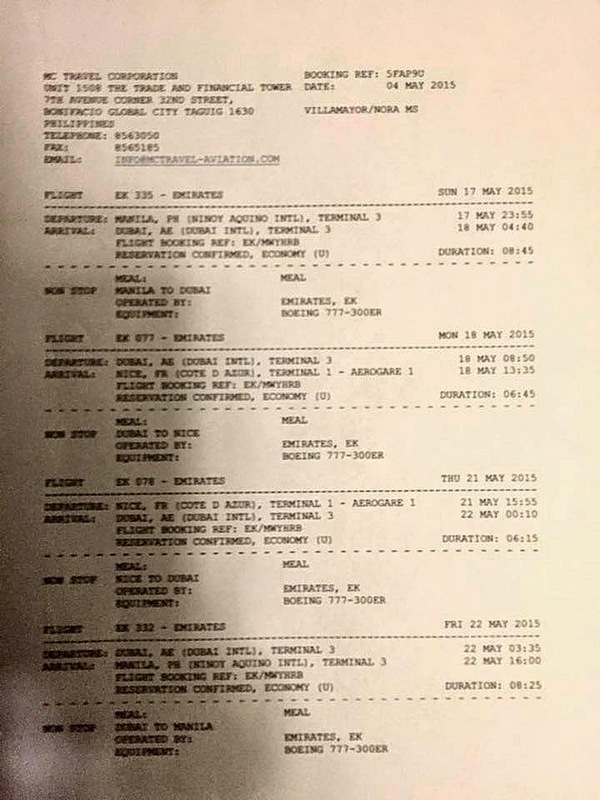 Latest social media posts show that Mendoza’s entourage includes Senator Loren Legarda, Solar Channel’s Wilson Tieng, actress Evelyn Vargas, actors Aaron Rivera, Ruby Ruiz and Raymund Gutierrez, among others. A few raised concerns why her initial request could not be done promptly, as the number of people in the entourage belies any claims of budget constraints. 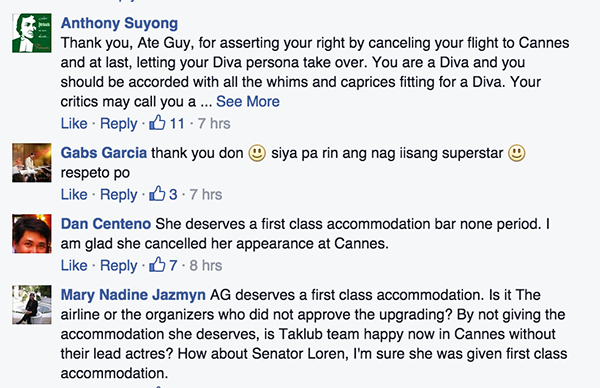 On the other hand, Honee Alipio, the scriptwriter of Taklub, is not part of the Cannes delegation. DLIST reached out to Larry Castillo of Centerstage Production for comments and will be updated promptly upon receiving reply. Excuse me, hindi lang basta diva si La Aunor. Siya ang Superstar! Ang nag-iisang Superstar. At wala pang sino man ang nakapantay hindi lang sa kasikatan kung hindi pati sa mga tinamong parangal locally at internationally. She is a living legend. sinayang nya pagkakataon na makilala ulit... wala na ngang box office appeal eh diva divahan pa. hwag mong isama ang boylet mo at gamitin ang pera pang upgrade sa iyo... laos na eh mayabang pa!!! bulagsak sa pera kaya ayan namamalimos ng ticket... kung tutuusin kaya nyan g bumili ng eroplano kundi lang sya nag adik at bulagsak!!! HiNDi niya na kailangan magpakilala ulit dahil matagal na siyang kilala! Ikaw cguro kahit Anong gawin mong pagpapakilala walang kikilala sayo! Kasi mapanghusga ka! Hiyang hiya naman ako sayo Ikaw na ang MALINIS at walang bahid na DUNGIS! At pakIwAri Ko Hindi ka pa nakaksakay ng eroplano Kaya Hindi mo alam Kung gaano kahirap tiisin ang mahabang niya he sa himpapawid...9 na Oras nga sa economy class mahirap na gaano pa ang 14 na oras....and she has all the right to demand because the movie itself is synonymous to her! The matter at hand is not about "diva-divahan", although she deserves to be called "DIVA" as she fits the description to a perfect T, but rather the respect and courtesy befitting a legendary icon and great international actress of the country. She is the only actress who brings international honors and recognition consistently to our country and she deserves comfortable accomodation as the lead actress of "Taklub" and health considerations being she just recently hospitalized. Comfort and privacy provided by Business Class befitting a National Artist/National Icon and sickly passenger for a long 14 hours flight to France. Given her stature not just as a Superstar but the Philippine's Premiere Actress...yes, I agree, she deserves the best flight accommodations she may demand. But that's besides the point, what happened to her advocacy about the film, the passion she had for the film, the message she wanted to convey to the world, her message of hope for the victims? Just because your whims were not granted, you won't go? there are dozens and dozens of elderlies seated at the economy class on a daily basis and far from the lavatories and exits and they experience discomfort not just 14 hours but even more. I could sense some immaturity here... it's like her eccentricities are back and to think she has been looking forward for her return to Cannes. 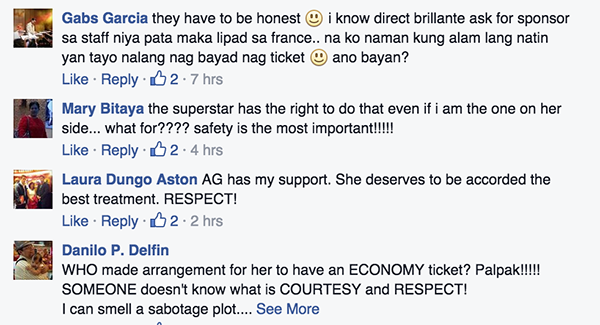 If I were her, I won't miss Cannes for the world even if I have to take a bangka to get there. So sad. The point is, the FDCP funds which could have been used for Ms. Aunor's business class booking were instead used to accommodate Mr. Mendoza's guests - minor cast and crew. Also, she did not demand to be given business class accommodations, she asked for it, and was willing to shell out her own money if the request could not be granted. She only found out at the last minute that her request fell on deaf ears. YOU take a banka to France for 14 hours & let's see where your ignorance of traveling gets you. She is the Superstar of Phil. Cinema. There were 17 or more wannabes that flew on this trip to France who are not even part of the film & got to be paid for flying business class. The Superstar is the lead & she's left with an economy class ticket? Eccentricities? I think not! Sad you say? You're the one I pity for your ignorance & no self worth if you think anyone let alone the Superstar should still go in an abysmal situation such as this. I travel four times a year between Manila and Europe for business. Sometimes I take business class, sometimes economy, or economy comfort (more legroom for a little surcharge). I take economy when my company has budget limitations due to the nature of projects at any given time. I don't mind the times I take economy since I'm sleeping most of the way anyway. I take it that Brillante Mendoza's company is an indie film outfit whose works while much appreciated by film buffs don't really that much money among mainstream audiences. They make small budgeted films for different reasons than making big profits; they know their films won't make Star Cinema incomes from the mainstream. Nora Aunor agreed to make these indie low budget films. She must know that indie films that get invited to international filmfests are still low budgeted and cannot afford to pay double or triple the price of an economy seat when the economy ticket will get you there just the same. A Cannes film festival event is important. She often goes on saying she's doing these films for the people, etc. And she doesn't go because it's an economy ticket? She ought to review her priorities for making films at this point in her career. She will not get cast in big budgeted movies that give the full diva treatment anymore. Her best route is really the indies to get acclaim from festivals and such. But that could mean no frills like business or first class tickets. But she gets noticed abroad, and at this point, she should be pleased with that without expecting the treatment given to Hollywood stars 20 years ago. While she might give brilliant performances in these indie films, it would be wrong to think that they owe her something, because they also give her her remaining opportunities. Two way street lang sana. Get foreign acclaim, not silly frills, like first class seats. You can't always have both. I do hope she gets recognized as Best Actress there as it's always good to have a fellow Pinoy get acclaim. But she could have made even more of an impact in Cannes had she gone. What a wasted opportunity. Sayang. Even if there were 100 other "wannabes" who all flew to Cannes and this was the reason you didn't get your business class ticket, you would refuse to fly there because of this? You would forget your advocacy, forget the public, forget the cause of RP movies, forget Cannes...because you feel you were not "respected" by being given an economy ticket? If the company didn't respect you, they would have not arranged for you to go there at all and just taken everyone else. But they did, but not the business class ticket you wanted. Silly actress. 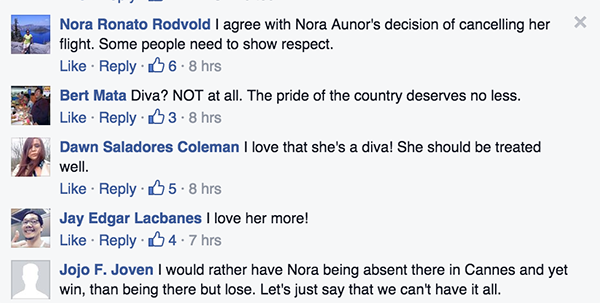 When she gets the National Artist Award (which could happen should PNoy's successor want to gain points from Aunor fans), I dread to think what more petty standards of "respectability" she would demand from those who don;t know any better. Would she want a throne to sit on during the ceremony so she could look down on the five other "wannabe" National Artists beside her? "Respeto lang." Would she want the cash award to be delivered to her house? "Respeto lang." Would she want the medallion in pure 24K gold? "Respeto lang." Ugh.